When retired family doctor Sam Moore's old girlfriend is murdered in a local hotel, the police suspect his involvement. The coroner, a former med school colleague whose husband is about to desert her, reveals that she had a crush on Sam in med school. When she is strangled the next day in her own morgue, Sam is once again in the hot seat. Sam's world falls apart when he returns home to find a family member killed in the laundry room, stabbed with his own garden shears. Rocketed into a world of denial and temporary insanity, Sam faces his worst fear, and is locked up in the very same psych ward he was in when his brother Bill died fifty years ago. Sam is determined to ask his long dead brother to help him. Billy, who communicates through a little green marble, has the ability to propel Sam through time and has helped Sam unwrap baffling mysteries in the past. Sam's plan: to change time, and bring his loved one back to life. 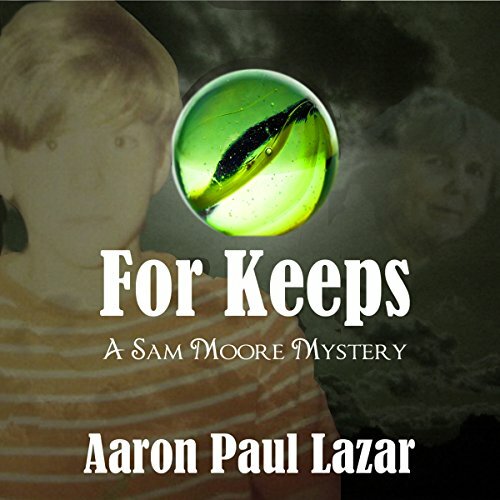 I have read or listened to nearly every one of Aaron Paul Lazar's books, and this one was the best of them. I was captivated and could not wait to get through the entire story. This is a must read/listen! I would highly recommend the entire Green Marble Mysteries series and to read/listen to them in order. You will be invested into the characters and fall in love with them and with Sam Moore. Enjoy! The plot twists in this book totally took me by surprise. When Sam gets blindsided by tragedy, he has to try to solve the mystery and set things right while contending with his own emotions, his past, his hard-to-control visions, etc, etc. I was blown away by how well Lazar wrote Sam's inner thoughts as he loosens his grip on reality in the aftermath of unbearable loss. Very, very believable, heart-breaking but not shlocky. Top-notch narration here by Robert King Ross. "What In The World Has Come Over Me?" Where does For Keeps rank among all the audiobooks you’ve listened to so far? For Keeps ranks in the top 20 of all of the audiobooks I have every listened to. I had to wait a while after finishing this book before I could write this review because it was the most complex story I've ever heard. This book has a plot like no other. I knew it had something to do with time travel since I had listened to the first book in the series, "The Disappearance of Billy Moore". I did not realize though just how many times I had to go back and listen to several chapters over to make sure I heard what I thought I heard. My interest was the strongest ever in this story. I totally think this series should be made into a TV series ! Robert King Ross is a soft-spoken narrator. However he somehow manages to instill a real sense of fear with a subtle change in his tone. I so enjoyed his portrayal of each character in the book. This book did create an extreme reaction but it was not laughter or tears...it was total and engrossing SHOCK ! I kept thinking about this book for over a week before I could put everything that happens in it's proper perspective. I may even go back and listen to this one a second time...kind of like when you watch a movie you like and you want to see it again to pick up things you may have missed the first time. Aaron gave me this book in exchange for an honest review. He is a very generous author and loves making friends with his readers. I've never been lucky enough to have an author for a friend and I thank my lucky stars over and over for his fantastic talent. He has brought so much into my life at a time when I was about ready to give up on humanity!